Abstract Background: Epidermolysis Bullosa is an autosomal recessive disease that refers to a group of inherited bullous disorders characterised by blistering and erosion of the skin and mucous membranes. There are four major types recognised and 30 subtypes. This case study will focus on the non-Herlitz Junctional Epidermolysis bullosa type. Mutations are present for the basement membrane mediated cell adhesion specific for the oral mucosa and the developing tooth bud. These patients have a normal lifespan and dental intervention is critical. Scientific literature is scarce on the management of these patients and is mainly recorded as case reports. Methods: A direct composite was used to restore the aesthetics and function of this patient. Conclusions: These patients are not easy to treat due to severe blistering and a staged approach should be employed. The use of direct composite restorations provides the opportunity to conserve the tooth structure as enamel is critical for a predictable bond. This treatment modality is a feasible treatment option for patients with non-Herlitz Junctional Epidermolysis bullosa disease. Figure 1: Right ear showing scarring and scabbing. Figure 2: Wounds on hand showing different stages of healing. Figure 3: Scarring and blisters on the outside of the hand. Case report A female patient of the age of 18 years with non-Herlitz Junctional Epidermolysis bullosa, presented at the dental faculty of the University of the Western Cape. The patient presented extra orally with multiple blisters, scarring and wound healing at various stages (Figures 1, 2, 3). Intra orally the patient presented with an intense erythematous band of attached gingiva on the buccal aspect of the teeth (15-21; 32-44) (Figure 4). The teeth presented with multiple defective restorations, caries and generalised enamel hypoplasia with pitting and furrowing (Figure 5-9). Sequence of treatment The patient’s intra-oral soft tissues were coated with copious amounts of petroleum jelly to obtain primary study and working models. Working models were articulated and the bite was opened 3 mm with the use of a diagnostic wax-up (Figure 10). Figure 4: Intense erythematous band of attached gingiva on the buccal aspect. Figure 5: Loss of tooth structure (13) and pitting and furrowing (3343). Figure 6: Maxilla showing an ulcer in the hard palate, with defective restorations, loss of tooth structure and trauma of the gingiva of the palate (12-22 area). Figure 7: Mandible showing defective restorations, loss of tooth structure, pitting and furrowing of teeth (34-44). Putty indices were made of the upper and lower anterior six teeth on the working models (Figures 11 and 12). These indices were used to transfer the new heights of the teeth from the models to the mouth. During the rehabilitation period endodontic treatment was first performed on teeth 11, 21 and 37 due to irreversible pulpitis (Figures13 and 14). The two maxillary central teeth (11, 21) were first restored using Masking agent (Universal shade 3M ESPE) to block out discolourations of these teeth. A2E colour (Filtek Supreme XTE, 3M ESPE) followed to complete the final restoration. The following appointment the 12,13,22,23, 33-43 teeth were restored with A2E colour (Filtek Supreme XTE, 3M ESPE) (Figures 15 and 16). Figure 13: Endodontic treatment of teeth 11 and 21. Figure 15: Anterior teeth restored with A2E (Filtek Supreme XTE, ESPE, 3M). Figure 14: Endodontic treatment of tooth 37. Figure 16: Occlusal vertical dimension was increased by 3mm on the anterior teeth. Figure 17: Restoration of the maxillary teeth 15-25. Figure 18: Restoration of the mandibular teeth 34-44. Figure 21: Restoration of the maxillary teeth 16,17,26 & 27. Figure 22: Restoration of the mandibular teeth 36,37,46,& 47. Figure 23: New aesthetic smile. Figure 24: Aesthetic result with the use of A2E (Filtek Supreme XTE, 3M ESPE). 24 and 25, 34 (Figures 17 - 20). The molar teeth were restored in the same sequence as the premolars. First the first molars were restored, followed by the second molars (Figures 21-25). Figure 26: Intra-oral ulcer after one month of dental procedures. Figure 27: Any trauma leads to excessive blistering. Figure 28: Healing after 1 week. and 32 and were repaired (Figures 26 - 28). A hard acrylic biteplate was supplied to protect the restorations against any chipping due to parafunctional habits at night (Figure 29). Conclusion These cases are not easy to treat due to severe blistering and a staged approach should be employed. The use of direct composite restorations provides the opportunity to conserve the tooth structure as enamel is critical for a predictable bond. Special considerations, such as the lubrication of the soft tissues to reduce mucosa irritation during impression taking will reduce the iatrogenic effects of the treatment. Patient motivation is of utmost importance as the patient will have to content with ulceration between visits. A holistic treatment approach for these patients include regular follow up visits for maintenance and prophylactic hygiene. Disclosure The authors do not have any financial interest in the products used in this case. Figure 29: A biteplate was provided for night time to prevent any chipping of the composite during possible night time grinding. Acknowledgements Mr Niell du Plessis for fabrication of the biteplate. References 1. Wright JT. Oral Manifestations in the Epidermolysis Bullosa Spectrum. Dermatol Clin. 2010; 28: 159–164. 2. Siqueira MA, de Souza Silva J, Garcia de Paula e Silva FW, Díaz-Serrano KV, de Freitas AC, de Queiroz AM. Dental treatment in a patient with epidermolysis bullosa. Care Dentist 2008; 28: 92-95. 3. Uitto J and Richard G. Progress in epidermolysis bullosa: from eponyms to molecular genetic classification. Clin Dermatol. 2005; 23: 33-40. 4. Pacheco W and de Sousa Araugio RM. Orthodontic treatment of a patient with recessive dystrophic epidermolysis bullosa: a case report. Spec Care Dentist 2008; 28: 136-139. 5. Atar E and Korperich EJ, 2009. Systemic disorders and their influence on the development of dental hard tissues: A literature review. J Dent 2010; 3 8: 296-306. 6. Pacheco W and de Sousa Araugio RM. Orthodontic treatment of a patient with recessive dystrophic epidermolysis bullosa: a case report. Spec Care Dentist 2008; 28: 136-139. 7. Quinonez R, Hoover R, Wright JT. Transitional anterior esthetic restorations for patients with enamel defects. Pediatr Dent 2000; 22: 65-67. 8. Wright JT, Cashion S and Hoover R.The esthetic stainless steel crown bridge: report of two cases. Pediatr Dent 1999; 21: 137-141. 9. Kramer SM. 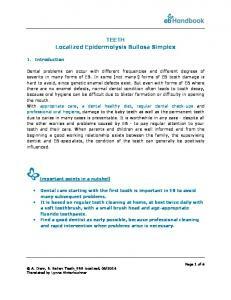 Oral care and dental management for patients with epidermolysis bullosa. Dermatologic clinics 2010; 28: 303-309 10. Oliviera MA, Ortega KL, Martins F, Maluf PSZ, Magalhaes MG. Recessive dystrophic epidermolysis bullosa: oral rehabilitation using stereolithography and immediate endosseous implant. Spec Care Dentist 2010; 30: 23-26. 11. Mü ller F, Bergendal B, Wahlmann U, Wagner W. Implant-supported fixed dental prostheses in an edentulous patient with Dystrophic Epidermolysis Bullosa. Int J Prosthodont 2010;23:42–48. 12. Fatahzadeh M, Radfar L and Sirois DA. Dental care of patients with autoimmune vesiculobulous diseases: Case reports and literature review. Quintessence Int 2006; 37: 777-787. Report "Direct composite full mouth rehabilitation in a patient with Junctional Epidermolysis bullosa: A case report"